In my heart, I'll always be a builder, cobbling together PCs from components and parts I've exhaustively researched and tested. But the appeal of prebuilt gaming machines is becoming undeniable these days, often challenging even the most frugal build in terms of price and including quality extras to which DIY-ers don't have access. WIth that in mind, we've begun massively expanding our coverage of gaming PCs here on GamesRadar, and that means establishing a rigorous methodology for testing and reviewing them, especially when considering them for our best gaming PC roundup. So what's our process like? The first and most important thing we look at is performance, and that's almost exclusively a result of what components are packed into a prebuilt's chassis. For a gaming PC, we prioritize GPUs over CPUs, given that's where most of the rendering for gaming applications takes place; if a manufacturer opts for a really high end processor that inflates the price and negatively impacts the overall value of a machine aimed at gamers. Fast storage is also important for dodging dreaded loading screens, so we tend to value speedy, competent SSDs much more than capacious HDDs. In terms of how a machine balances workload vs. running games, we're looking for a heavy bias towards the latter, though any machine capable of handling modern games will as a natural consequence also be at least semi-capable where workload tasks are concerned. Like anything the hardware team tests and reviews, one of the most important considerations is always value, which shouldn't be conflated with price. We expect a PC to cost a little more if it's full of high quality, expensive parts, sure, but we want to ensure you're never being overcharged. Our process very much favors getting what you pay for and trimming unnecessary extras - liquid cooling may look great on a spec sheet, but if your machine is never going to generate the TDP to require it then it's wasted cost. 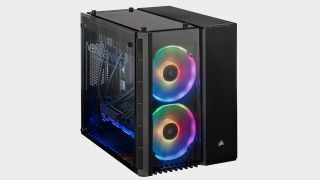 The ideal prebuilt comes with useful extras you can't get anywhere else at a price close to what it would cost you to put together the included parts yourself. Beyond a standard suite of generic benchmarking utilities that we use to test that the components in a machine are being properly utilized and living up to their potential, stuff like CineBench and 3DMark, we extensively test gaming PCs for their primary, intended use. We run them through some of the built-in benchmarks in a number of games, like Metro Exodus and Shadow of the Tomb Raider, and report how each machine handles modern triple-A titles at a variety of settings to give you a sense of where these machines live in terms of 1080p, 1440p, and 4K performance. And then we push these rigs during extended stress sessions, challenging their high end performance for hours at a time in some of the most demanding and best PC games available, to make sure they aren't glass cannons that will crumble under pressure. PCs are expensive, and while performance out of the box is essential if you're going to invest a lot of your hard earned cash into a machine you want to know it will last more than a handful of months. That's why we weight machines that are easy to upgrade and look for features like toolless case access, and an interior with ample space to swap and install additional components. The best machine will come loaded to bear for the games of this generation with enough room to upgrade it to take on whatever's coming next, stuff like additional storage bays, DIMMs to slot in more RAM, or additional PCIe lanes if you want to SLI in another video card. We understand that most PCs don't live in the vacuum of a spacious testing lab, so we prefer PCs with thoughtful design touches that make them easy to use in real world settings. We reward stuff like a multitude of front-facing USB ports in easy-to-reach spots on the case, or a slender, compact form factor (that doesn't compromise on heat or noise) so that a machine can easily be tucked under a desk or into an entertainment center. Much as PCs may have once been a speciality market, the reality is that they're now consumer electronics, especially gaming PCs, and they need to work as well in a bedroom as in an office. Finally, as I mentioned in the value section, we look for the helpful extras that are actually valuable to you, particularly features that are only available in prebuilts. This includes practical stuff from cable management systems and easy to remove storage bays to comprehensive warranties or service agreements. But it also means that where aesthetic frills are included, we prioritize ones that are intelligently designed - 16.9 million color RGB lighting doesn't do you much good if it's tucked away in a case where no one will ever see it, and elaborate flourishes are wasted on the rear of a case. Bonus features should be just that, extras that you're happy are included but for which you're not paying a massive premium. If you're confused about some of the technical lingo, or just want a general breakdown of all the terms we use when describing the hardware we test, bop on over to our comprehensive hardware glossary.